A lot of time can be spent on small parts. Most go in the electrolysis tank for a few hours to get rid of rust and paint. Some get primed and painted. Others get powder-coated. In this case, "electrolysis" is not hair removal. If you have a container that will hold water, and a battery or battery charger, it is a piece of cake to set up, and it is by far the best way I have found to deal with rusty, dirty parts. Here is a link to my Electrolysis page. Rusty springs are hard to deal with. Some just get replaced, but I have successfully cleaned and powder-coated a few. If the coils are tight together, I have to stretch the spring on a rack before cleaning and powder-coating. The powder needs to get between the coils. I like restoring old parts rather than buying new ones, even when that is not the most practical approach. This was a great find! While cleaning layers of paint and crud off the Overdrive shifter, started seeing yellow metal. The shift lever is solid brass! I couldn't resist the temptation to shine it up. I ground the rough edges, then sanded, buffed, and polished. The final step was a clear powder coat finish to keep it shiny. The other side. Look close and you will see a bit of throttle linkage perched on one of the spark plugs. That part needed another coat of paint, and this was a convenient place to stick it. The plugs will be changed before I crank it up. These old ones are just keeping trash and paint out of the engine. It might not look like much progress in two weeks, but I do have a day job and spring cleaning is taking a lot of extra time this year. There are still lots of small parts that seem to need a little work or refinishing. If we were not careful labeling and storing bolts, this is where we search through containers for the right fasteners. I replace a lot of hardware at this point. 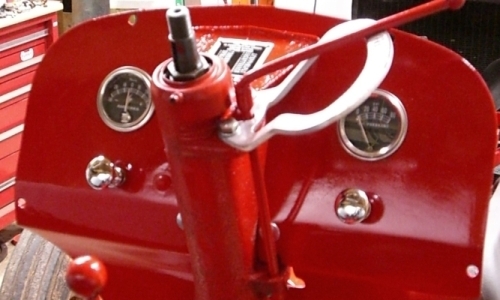 Anything that is a little rounded-off or corroded does not go back on the tractor. The running boards are protected with plastic so they don't get ugly before the project is finished. Funny how the paint in this last picture suddenly turned orange. It may not look that way on your computer, but this illustrates why we can't depend on colors rendered on our computer screens. 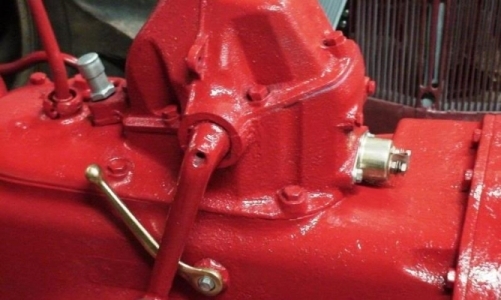 This is Rustoleum Sunrise Red color that I have found to be a great match for the Ford red. Trust me, for some reason only camera geeks understand, the color turns orange in some photos. Finally got the dash on and started sorting out the alternator brackets and wiring harness. How do you like them knobs? The new "Ignition" light is also visible just to the left of the steering column. This will be wired to turn on when the key is ON, because sometimes I need all the help I can get. GRIN. The finish on the dash is OK. I tried hard to get this part perfect, but missed again. There are some ripples and dings in the metal that I didn't quite get out. Bummer, but still better than Ok for a working tractor. I went ahead and put clearcoat on it for added protection and shine. The knobs are heavy nickle and chrome drawer hardware with the holes drilled and tapped to fit the headlight switch and choke knob. 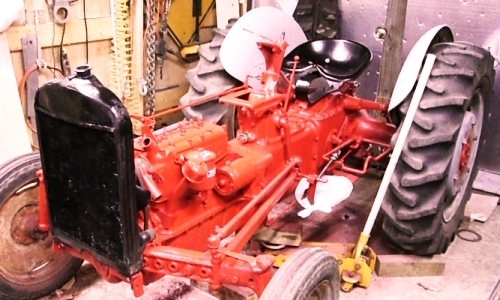 It was a beautiful weekend, so my only other tractor work was rebuilding two 6-volt generators for my 52. The generator started making bearing noise, so I wanted to make sure I had at least one working spare ready to go. I ended up rebuilding two. It is SPRING! Time to get out in the yard, soak up some sun, and work on things like flower beds and gardens! A package showed up from Eastwood. This is a zinc electroplating kit. Now I can go through that bin of rusty bolts and find the special ones that can be refinished and made like new again. This process is a little over my usual limit on dangerous chemicals and waste products that have to be disposed of in special ways. I'm about to find out if small-scale electroplating is worth the trouble. My apologies to anyone following this project. Progress has been stalled while other projects moved to the front burner. Moving this web site to a new address created a whole new class of aggravation. There was a laundry room remodeling project. My car needed another clutch and we ended up replacing the entire car. For most folks that would mean simply trading the old one in and driving away in a car that hopefully won't need work for a few months. But I'm not that smart. We bought a car, I spent a couple of weeks repairing and selling the old car, then spent a few weeks customizing the new car until it was more in line with my redneck specifications. Sheetmetal is next. I found a set of plain 2N fenders that will be refinished. The raised Ford logo 8N fenders from the 2N will be repaired and refinished for my 52. Alternator brackets needed work. The ones I took off look like they were cut from sheet metal with tin snips. Not very sturdy, which might explain why there were two peices per side. In fact, these "brackets" worked much better than many sturdier attempts I've seen. 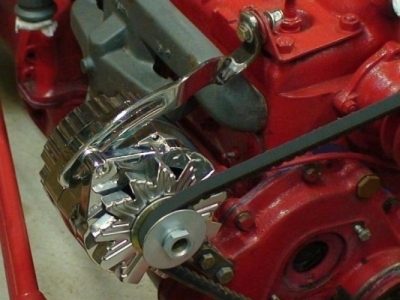 The new adjustment bracket for my chrome alternator will of course have to be curved and chromed to match. The new lower "H" bracket has been cut, and bent. Ready for welding, grinding, and finishing. Finished welding, grinding, and test-fit my alternator brackets. The top bracket bolts to the original top adjuster bracket in the cylinder head. I have a set of original generator brackets, and a rebuilt generator, just in case I end up going back to 6 volts. I don't want to change anything going to 12 volts that isn't a simple bolt-on part. The generator, that came in a box of old parts with the tractor, appears to be the correct 3-brush model No. 2N10000. 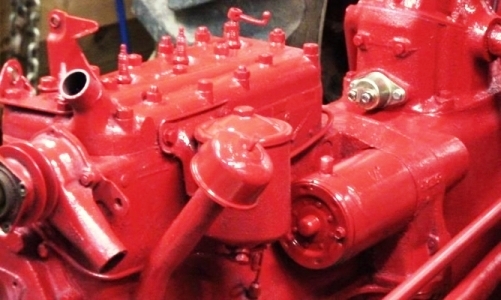 This generator is very similar to the 3-brush generators used on the 9N tractors. The adjustment screw on the back of the case was used to adjust generator output voltage. These early systems used something called a cutout relay between the generator and battery to control how the generator charged the battery. The wiring harness is done. It was fitted, and then removed so it wouldn't be trashed while other work was being finished.